The current options for managing digital certificates are limiting: they’re either manually intensive or pricey. Between these extremes, there’s a portion of people who simply value their time, resources and don’t want to mess up with spreadsheets or other manual solutions. For those who wish to automate the process and secure their network at a reasonable price, we’ve built Keyhub, the one-stop platform for managing company’s SSL\TLS certificates, so that nothing stays off the radar. While we’ve made great progress so far, there’s still a lot to do. Here’s a look at everything we’re working on, along with what’s ahead. 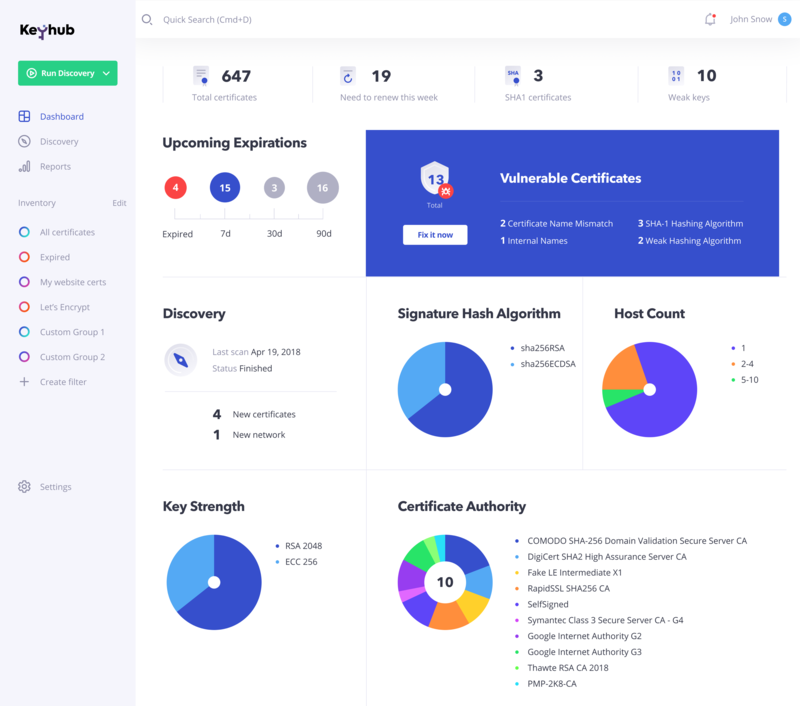 We’ve designed Keyhub to help SecOps and NetOps experts and all who directly manage SSL\TLS certificates discover, organize, and track them with ease. It’s handy for tracking certificate expiration dates, potential vulnerabilities and policy violations.  We’re finishing up the product and at this stage are looking for beta-testers to share feedback with us. As we aim to build a solution that really fits your needs, we invite everyone directly engaged in managing certificates to test our beta. It doesn’t matter how many certificates you have, be it 5 or 5,000, you are very welcome to try out Keyhub. We wanted to make the onboarding as smooth as possible, so as not to waste time on setup and configuration. So we’ve come up with a two-step process that already includes a setup for the first scan. 500 certificates in 30 seconds — that’s what we call fast. 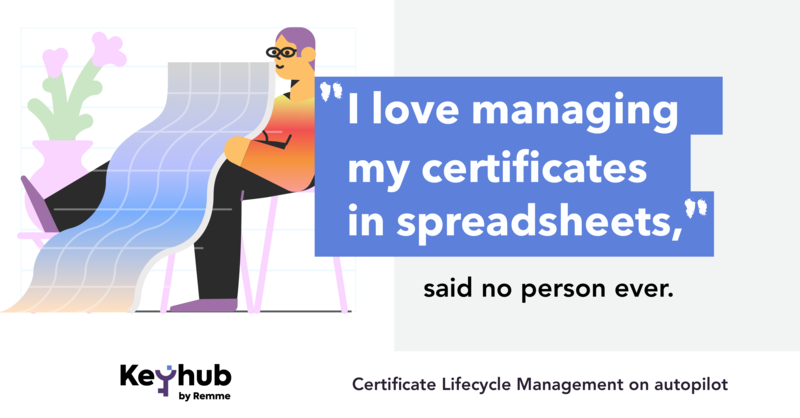 With Keyhub you can not only manage certificates that you know about, but also double check if you or your teammates have accidentally missed something. How great is that, to be able to spot a missing certificate before it expires and causes trouble? 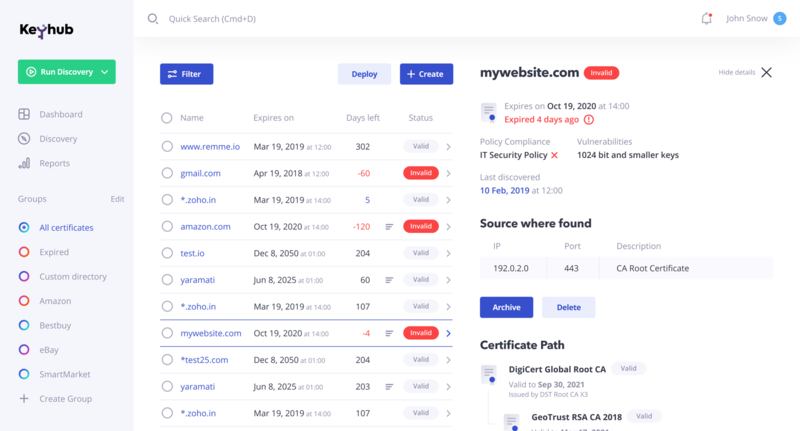 First and foremost, you can detect all certificates by scanning your external environment, including public available endpoints and subdomains. 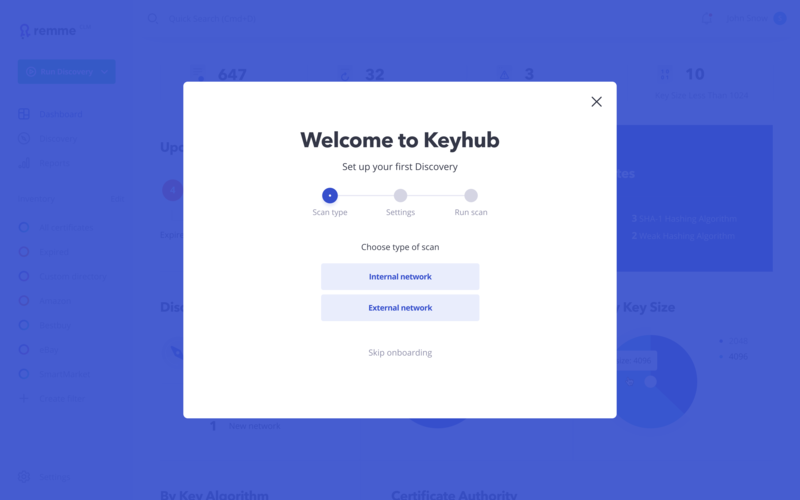 Bring all certificates to your Keyhub inventory to further organize and analyze them. With an unlimited number of scan profiles you’re free to run a single scan or all configured scan profiles with just the click of a button. This beta version offers only external scans but we’re working on extending it to internal scans in the next release. Next in the pipeline is the introduction of a vulnerability widget that will track certificate compliance with the imposed policy and detect common errors. Because your inventory stores tons of data, it’s easy to get lost when looking for specific info. To guide you, we’ve designed an easy-to-navigate inventory with flexible filtering, sorting and quick-access groups. Narrow down your query to get the most relevant certificate list. Simply set conditions that best suit your need to filter certificates by public key, expiration date, signature algorithm, common name, issuer name, and host count. If you need specific certificate lists at hand, just save filtered certificates as Groups for further access in one click. Plus, you can easily access these groups in one click, right from the dashboard. The next release will include the possibility to remove and upload certificates manually, apply sorting, contextual search, and view detailed chain details. While today’s beta release offers many features, there’s a lot more coming. Here’s a quick glimpse of what the future holds. The main piece we’re still working on during the beta is the ability to scan your internal environment as well as a vulnerability widget to track certificate compliance with the imposed policy and detect common errors. We are also working on corporate policy setup and API integration to provide you with maximum flexibility. That said, our work on Keyhub won’t stop after our official launch. Our team has a long list of improvements and enhancements already planned. Check out the full list of features on our website and try Keyhub out. The Beta is completely free. Got a feature you want us to build? As always, we’re glad to hear your feedback, thoughts, and questions as you get started with Keyhub. Just send us an email to keyhub@remme.io.